If you are looking for information on how to perform CRUD operations on specific resources using REST, see Common tasks using the Azure Cosmos DB REST API. If you are looking for samples on how to perform CRUD operations using C# and REST, see the REST from .NET Sample on GitHub. You can also perform CRUD operations on Cosmos DB resources using the Cosmos DB SDKs. For samples, see Azure Cosmos DB examples. For links to the SDK downloads and documentation, see Cosmos DB SDKs. POST means create a new item resource. 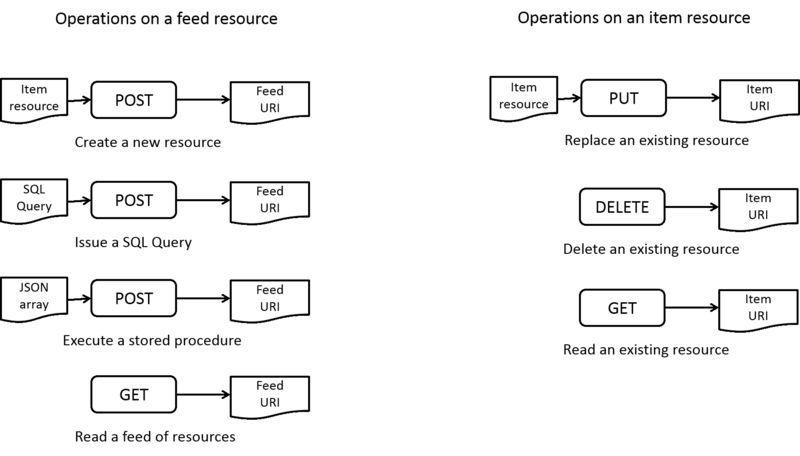 As illustrated in the following HTTP verbs diagram, POST can only be issued against a feed resource; PUT and DELETE can only be issued against an item resource; GET and HEAD can be issued against either feed or item resources. To get a better feel for the interaction model, let’s consider the case of creating a new resource (aka INSERT). In order to create a new resource, you are required to issue an HTTP POST request with the request body containing the representation of the resource against the URI of the container feed the resource belongs to. The only required property for the request is the ID of the resource. As an example, in order to create a new database, you POST a database resource (by setting the ID property with a unique name) against /dbs. Similarly, in order to create a new collection, you POST a collection resource against /dbs/_rid/colls/ and so on. The response contains the fully committed resource with the system generated properties including the _self link of the resource using which you can navigate to other resources. As an example of the simple HTTP-based interaction model, a client can issue an HTTP request to create a new database within an account. The Azure Cosmos DB service responds with a successful response and a status code indicating successful creation of the database. The stored procedure can be registered to a collection under MyDb by issuing a POST against /dbs/_rid-db/colls/_rid-coll/sprocs. The Azure Cosmos DB service responds with a successful response and a status code indicating successful registration of the stored procedure. Finally, to execute the stored procedure in the preceding example, one needs to issue a POST against the URI of the stored procedure resource (/dbs/UoEi5w==/colls/UoEi5w+upwA=/sprocs/UoEi5w+upwABAAAAAAAAgA==/) as illustrated below. The Azure Cosmos DB service responds with the following response. Note that the POST HTTP verb is used for creation of a new resource, for executing a stored procedure, and for issuing a SQL query. To illustrate the SQL query execution, consider the following. The service responds with the results of the SQL query. Replacing or reading a resource amounts to issuing PUT (with a valid request body) and GET verbs against the _self link of the resource respectively. Likewise, deleting a resource amounts to issuing a DELETE verb against the _self link of the resource. It is worth pointing out that the hierarchical organization of resources in the Azure Cosmos DB’s resource model necessitates the support for cascaded deletes wherein deleting the owner resource causes deletion of the dependent resources. The dependent resources may be distributed across other nodes than the owner resources and so the deletion could happen lazily. Regardless of mechanics of the garbage collection, upon deletion of a resource, the quota is instantly freed up and is available for you to use. Note that the referential integrity is preserved by the system. For instance, you cannot insert a collection to a database which is deleted or replace or query a document of a collection which no longer exists. Issuing a GET against a feed of resources or querying a collection may result into potentially millions of items, thus making it impractical for both server to materialize them and clients to consume them as part of a single roundtrip/ request and response exchange. To address this, Azure Cosmos DB allows the clients to paginate over the large feed page-at-a-time. The clients can use the [x-ms-continuation] response header as a cursor to navigate to the next page. If two clients simultaneously issue mutating requests (via PUT/ DELETE verbs) on a resource with the latest version of the resource (specified via the [if-match] request header), the Cosmos DB database engine subjects them to the transactional concurrency control. If a client presents with an older version of the resource (specified via the [if-match] request header), its request is rejected. Gateway Mode: The clients are shielded from the translation between logical to physical addresses or the details of the routing; they simply deal with logical URIs and RESTfully navigate the resource model. The clients issue the requests using logical URI and the edge machines translate the logical URI to the physical address of the replica which manages the resource and forwards the request. With the edge machines caching (and periodically refreshing) the routing table, routing is extremely efficient. Direct Connectivity Mode: The clients directly manage the routing table in their process space and periodically refresh it. Client can directly connect with the replicas and bypass the edge machines.